Today we are going to hear from another one of my very talented Flickr swap friends Kerry. Thanks for stopping by and sharing your wisdom with us Kerry!! Hi, I am Kerry from verykerryberry, I live in the UK in a little city by the sea and I blog about my sewing life and vintage finds. As this is a post on manners I need to thank Kat for this slot in her series of guest posts on the theme “Blogging Etiquette”, a great idea as there are a lot of issues and whenever they are raised, hot discussion ensues. I have been blogging for a year and learning the ins and outs of blogging is an ongoing process, I am only at the beginning. These are the things I know so far about blogging etiquette. Which blogs do you read and admire and why? A good place to start when considering Blog etiquette, is to think about what works for you & what doesn’t when you read other people’s blogs. For example some blogging voices are confessional and intimate. Others are distant – you may not know (and they may not want you to know) the blogger’s real name. Do you use a persona on your blog? Blogging etiquette reflects these styles. It can also change. My blog voice is more confident now than when I started. So how do you want to blog? Flickr and Blogging- I blog as a social tool and to share. Sewing is solitary, my friends don’t really want to talk fabric each time we meet so on my blog I get to share with like minded individuals. I also blog to keep a record of what I make and what is inspiring me at any given time. For me blogging has a close relationship with Flickr, the photo sharing site and many of my sewing projects start there. Contact- As a blogger you are putting material out onto the world wide web so expect communication. I find it really frustrating when I can’t find how to email a blogger. You can always leave a comment on their latest post but making email easy to find is so helpful. To avoid spam scanning for email addresses you can spell it out- kerrykit at yahoo dot co dot uk. I add a picture button with a link to my address. Visit shabby blogs for similar! Comments- I don’t think I have ever come across a blogger who doesn’t welcome a comment. I like it when I know how a blogger responds to comments and this is normally written by the comment box. For example, some respond within the comments- I am not the biggest fan of this, you have to find the post again to see the response but if you are going to do it, I’d prefer it if you’d say. Some people don’t respond at all- I find this a bit rough, if someone is taking time out to give you a bit of feedback some sort of response would be good , even a quick, “Hey thanks”or even a group response within the comments. This is hard for very popular blogs with thousands of followers but ironically I have found they often do respond. Then, there are bloggers who will email the commenter back, say hi, thanks, answer a question. I favour this but it takes time and dedication. I do this now when I can find the commenter’s email-(don’t forget to check your blogger profile, do you know if people can contact you?) I do wonder how this works with more followers. Linking and sharing- I find this fairly straightforward. If you want to share someone’s Flickr pic on your blog e.g. in a mosaic, or just cos you like it, the code that you paste from Flickr automatically puts the original link in for you when the pic is clicked. Flickr is a sharing site, if you don’t want your Flickr pics blogged, or used in mosaics, check your privacy settings. I do find it a little mean spirited when people make inspiration mosaics, post the pic on their blog or Flickr and don’t paste in the links. Give credit where it is due, share the love, show the creators, let their work inspire others. Other photos on people blogs are different- always ask. You can protect yourself by labeling your pics, time consuming but effective. What about links? If I have read something I think others will like I put a link on so readers can choose to visit. However, when I write a tutorials with links to other people’s blogs to show a technique I sleep easier knowing I asked their permission and they said yes. 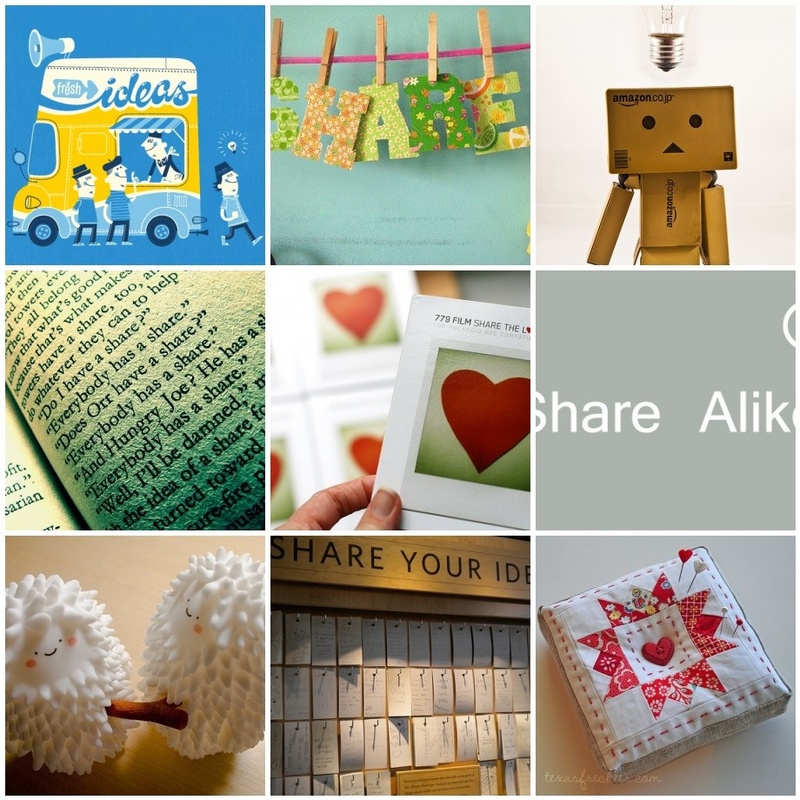 Share and Share alike- Ultimately, blogging to me is about sharing. I read lots of blogs, use their tutorials, enter giveaways, find fabric and ideas- I want to give a bit back and do the same for others. If you put your work into a public arena you run the risk of being ripped off, copied etc. Although your blog can be proof of who made what and when. I am happy to take the risk for the greater good of crafty blogging. I have made the best online friends with bloggers whom I never dreamt would email me, share stuff and chat online. I have made friends with whom I share maybe nothing but a deep love of the same fabrics and it has lead to happy online times. I get the biggest thrill with each follower and commenter. Most of all blogging makes me happy. Kat, thank you for this series, and Kerry, thank you for this lovely post. As a blogger I agree about the comments. Don’t be shy, readers! If you’ve stopped by, leave a little comment to let the blogger know you have. It will make them very happy! These posts are great. I, too, wish more bloggers had their return email available so I can write back after they comment, especially when they ask questions and I have no way to contact them! I wish there were easier ways to figure out how to do things on your blog. People seem to have such great pictures, gadgets etc. I have the hardest time linking and putting a button on. This is great Kat and Kerry. I’m learning so much here, thanks heaps. You’ve summed up the joys of blogging! Especially the sharing caring side. Thanks for your thoughts. I really loved all the pictures too!! I’m with you all the way on the comments thing. If people didn’t comment on my blog I would stop writing because I’d assume nobody was interested in what I had to say. I comment on lots of blogs because I assume other bloggers feel the same. It’s a bonus when bloggers respond back. When I first started blogging I had to leave comments in my blog because I didn’t know how to respond to individual comments. It’s much nicer now I know how to respond personally. If you are unsure over blogging gadgets and tricks- I keep a bookmark folder on my computer for anything linked to blog stuff that I think I might use in the future- e.g. How to number your comments- I also keep a notebook for blogging and if I learn how to change the blog template or do a picture trick I keep a note otherwise next time I won’t know how to do it. Blogger help and google are both very useful when searching for new blog gadgets and tricks and you can always ask people how they did the button on their blog or which template they used- they might even tell you! That was a really helpful post, as was yesterdays, I am really new to blogging and I can’t tell you how much this is helping me. Kerry, this is a well-written primer for anyone wanting to start a blog. The only thing that I wish was better understood is the issue of “no reply” comments. That is a problem ONLY for people who use Blogger instead of other platforms. And it is a problem because in order to not be “no reply” you are FORCED to set up a Blogger blog. A Google account isn’t enough. When you leave a comment on a Blogger blog, even if you select your profile as Google Account, you can show up as “no reply”. And selecting WordPress, Open ID, Name/URL, etc. doesn’t work either. Those of us who use other blogging platforms have to set up empty Blogger blogs to comment. I get signed out of mine frequently without knowing it and won’t know that I’m showing up as “no reply”. A lot of commenters don’t have blog, don’t want to have to set one up to comment, and might not want to put their email into a comment even in a spam-avoiding format like you suggested. They are out of luck with Blogger. I wish those of you who use Blogger would insist that Blogger change the way someone leaves a comment and make it more similar to WordPress or Typepad. They require your name and email address and have the option of URL if desired in order to comment. Only the blog writer sees the email address for a reply and you NEVER have a “no reply” comment. I understand that Google probably set up Blogger commenting in this way in order to force people into setting up their blogs on Blogger, but given the number of complaints that people who use Blogger have about “no replies”, it isn’t working and it is a real pain to comment for those of us who either don’t have blogs or who use other platforms. At least you know we REALLY are loving something you’ve done if we go through all those hoops to leave a comment on a Blogger blog! Thankyou Anne for the insight in the comment/reply issue- wow it is quite complicated! Maybe this has to do with how people set up their comments preferences on blogger. I ticked a box which takes ‘anonymous’ comments which I hope gets round this as I don’t expect everyone to have a blogger profile. I did try a wordpress blog before blogger but I found it less user friendly but as you say the comment set up is more accessible. Kat this series is awesome. So helpful! So very informative and well written. Thanks so much. So very written! Kerry ‘s viewpoint on this gave me very fresh perspective on blogging itself. What I can’t agree more is that comments are always appreciated by bloggers. It makes a big big difference when we know there is someone out there who read our blog posts that could take lots of time and effort. Thank you Kerry and Kat! Thank you Kit for this great theme and thank you Kerry for a good post! A agreee with everything you said! Lets all enjoy blogging and do it in proper way! Wonderful post! I have only been blogging for 5 months, but have had to learn some of this the “hard” way. So lovely to have this series to read and refer to. Thanks! Re: Blogger and No Reply comments – I use Blogger but don’t have a blog myself. If you have an account I think you need to go into ‘Edit User Profile’ and tick the box ‘show my email address’. I hope I’ve got this right – it’s a while ago since I updated mine, but now bloggers can (and some do!) send me an email in response to any comments I may leave. WandaFish has a good point, I forgot this when i first had a blogger profile. If you enter giveaways and this box is not ticked you can’t be contacted when you win! Thanks so much for doing this series. I’m learning a bunch. Great post! I’m always trying to be a better blogger (and follower). Very informative topic, Kat and Kerry. And, to everyone else, the comments are really helpful. Thanks! Great series Kat, and such a useful post.Thanks Kerry.